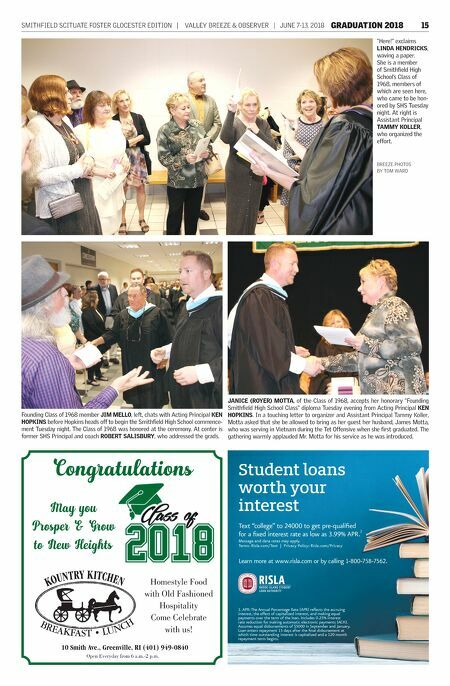 14 GRADUATION 2018 JUNE 7-13, 2018 | VALLEY BREEZE & OBSERVER | SMITHFIELD SCITUATE FOSTER GLOCESTER EDITION Classmates from the CLASS OF 1968, the founding class of Smithfield High School, were honored as part of this year's commencement ceremony at Bryant University. The group gathered only momentarily before heading to the gym. 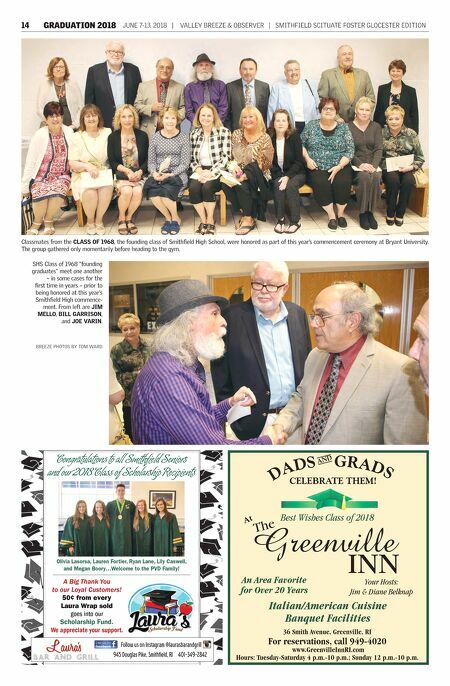 BREEZE PHOTOS BY TOM WARD SHS Class of 1968 "founding graduates" meet one another – in some cases for the first time in years – prior to being honored at this year's Smithfield High commence- ment. From left are JIM MELLO, BILL GARRISON, and JOE VARIN. The Greenville INN Your Hosts: Jim & Diane Belknap Italian/American Cuisine Banquet Facilities Best Wishes Class of 2018 An Area Favorite for Over 20 Years 36 Smith Avenue, Greenville, RI For reservations, call 949-4020 www.GreenvilleInnRI.com Hours: Tuesday-Saturday 4 p.m.-10 p.m.; Sunday 12 p.m.-10 p.m. D a D s G r a Ds anD Celebrate them! at Congratulations to all Smithfield Seniors and our 2018 Class of Scholarship Recipients 945 Douglas Pike, Smithfield, RI 401-349-2842 Follow us on Instagram @laurasbarandgrill Olivia Lasorsa, Lauren Fortier, Ryan Lane, Lily Caswell, and Megan Boory…Welcome to the PVD Family! A Big Thank You to our Loyal Customers! 50¢ from every Laura Wrap sold goes into our Scholarship Fund. We appreciate your support.